Trout is a small, lightweight, freeware audio player with extensive format support. Simple, standard drag-n-drop interface. Trout also has last.fm scrobbling support, FreeDB lookups for CDs, a lyrics display, toaster popup, album art and more. 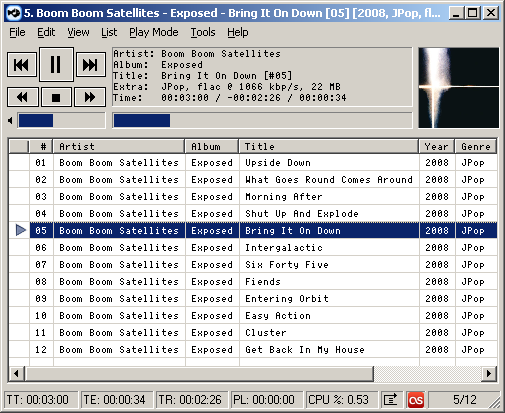 Main listview displays extensive information about music tracks. Trout supported audio formats standard and w/plugins, Basic freeDB support for audio CD track titles, Support for internet radio streams. Small, lightweight, freeware audio player with extensive format support. * Commandline parameters for external control (/play, /stop, /prev, /next, & /mute). Qweas is providing links to Trout 1.0.6.63 as a courtesy, and makes no representations regarding Trout or any other applications or any information related thereto. Any questions, complaints or claims regarding this application Trout 1.0.6.63 must be directed to the appropriate software vendor. You may click the publisher link of Trout on the top of this page to get more details about the vendor.